The Ten of Cups as with all of the tens of the Minor Arcana is symbolic of the end of a suit and the final good or bad of that element. Luckily the Ten of Cups is a card for good. Generally this card indicates stable happy families, friends and relationships. In the sense of the family then this is a card of feelings of permanent security, where the whole family is committed to family values and working together toward a greater good. In the sense of friendship, then joy and contentment are starred. For existing relationships then you may feel emotionally satisfied. With this card in your spread it suggests that family, friends and relationships are playing an important role in your life; and you are building up a secure network of caring, trustworthy people around you that will support you into the future. 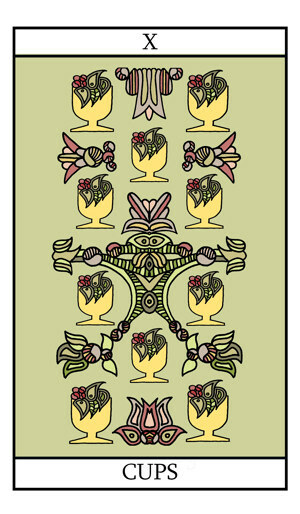 The Ten of Cups Card illustration.